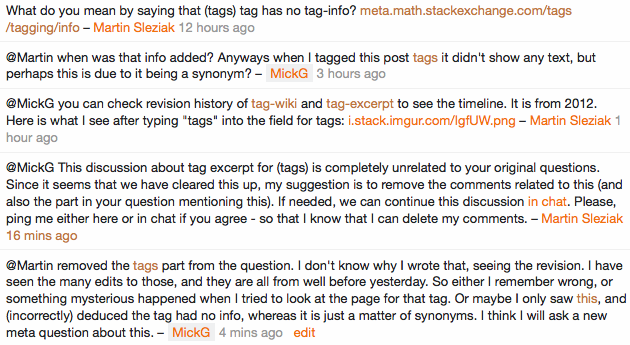 So I thought the tags had no info, and noted it in a "BTW" sentence at the end of the question. I removed it a while ago as per Martin's suggestion, since it was unrelated to the question. Before the suggestion, though, Martin (in this comment exchange which we will now likely clean up) noted the info was present. My guess here is that the info did not show up because tags is a synonym for tagging, and the info only shows up on the main tag. Is that true? And why is that so? Wouldn't it be better if the info showed up on synonyms too, or at least taggers were notified of the tags they are choosing being a synonym so they can look (if they wish) at the info on the main tag? PS Curiously enough, I just tried to tag this tag-synonyms and that thing didn't show up, whereas tag-management did, with "also:tag-management" at the end. Was tags made a synonym of tagging only recently perhaps?